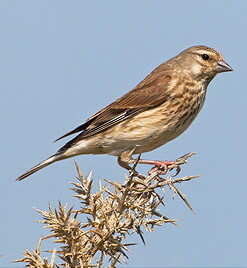 Both Linnet and Twite occur on Arran, with most records from the west and south of the island. Both breed on Arran and, in addition, birds on migration add to the numbers present in spring and autumn. The Linnet is more widespread than the Twite. The largest group of Linnet reported in the last few years has been 300 on Cleats shore on 29 August 2008 while the largest group of Twite is considerable smaller being 50 on Kilpatrick shore on 26 September 2008. Looking at the records of both species over the last five years most records for Twite occur in September and October while most records for Linnet occur from April to September. Interestingly there are no recent records of Linnet in December, January or February. In the depth of the winter Linnet seem to leave Arran. In breeding plumage Linnet and Twite are relatively easy to tell apart but it is much more challenging when the birds are not in breeding plumage. 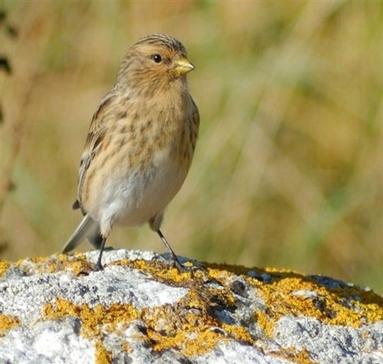 Linnet and Twite out of breeding plumage are both “little brown birds”. Both have white flashes in the primaries and tail but here are some handy hints to help tell them apart. In late autumn and winter Linnets are rather nondescript buffy grey birds. The rich buff underparts and the darker browny buff upperparts are profusely streaked with grey-brown, but this is subdued and rather diffuse. The head is grey, with a pattern that is also rather subdued, making the bird look quite plain-headed from a distance. * A distinctive and rather beautiful orange-buff ground colour to the face and the unstreaked throat. Brown streaking extends from the sides of the breast rather diffusely down onto the flanks, but the belly and undertail coverts are white. * Darker brown upperparts with darker streaks, and a more prominent wingbar, varying from buff to whitish, across the tips of the greater coverts. * An obviously yellow bill in winter, contrasting with the face. In summer the bill is grey and it normally starts to darken in March-April. Look out for both these birds on Arran this year.